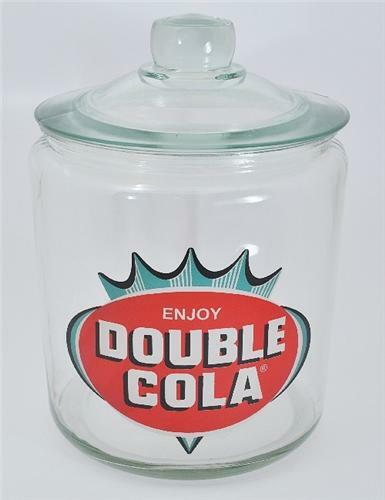 From our New Summer Inventory is this very nice "Enjoy Double Cola" Counter Display Advertising Snack Jar. The jar is a very nice reproduction piece with a plastic firm fitting lid seal for a nice tight closure. Glass is nice and thick and the emblem and lettering are quite clear with nice vivid coloring. A very nice large size too! Perfect for displaying your crackers, candies, or snacks! One customer bought several different kinds of these jars (which we have listed) and uses them without the lids to store her cooking spoons, spatulas, and other utensils in! Great idea! This item will ship USPS or Fed Ex at no cost to you. We Pay All Shipping Charges for You!